Five singers were chosen from more than 365 applicants from 61 countries and will join the Company for two years of artistic development. The Royal Opera has announced the latest intake of Jette Parker Young Artists, who will join the Company in September 2017. The JPYA programme is designed to support the artistic development of talented singers at the beginning of their career. Young Artists are employed as salaried members of The Royal Opera over a two-year period, during which time they are immersed in the life of the Royal Opera House to help them form their own artistic identity and give them guidance on their trajectory through the business. The performers participate in a specially-tailored programme, which includes extensive daily coaching in languages, stagecraft and vocal techniques, alongside preparing cover roles, and performing concerts and smaller roles on the main stage. 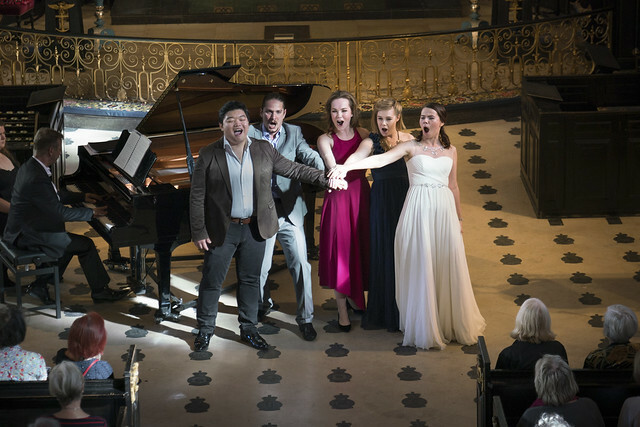 This year's intake includes American soprano Jacquelyn Stucker, Korean soprano Haegee Lee, Russian mezzo-soprano Aigul Akhmetshina, Korean tenor Konu Kim and British baritone Dominic Sedgwick. The five singers joining The Royal Opera later this year were selected from more than 365 applicants from 61 countries and were selected by a panel including Music Director Antonio Pappano, Director of Opera Elect Oliver Mears, Director of Casting Peter Mario Katona and Artistic Director of the Jette Parker Young Artists Programme David Gowland. They will join the five singers who entered the Programme in September 2016, and who will move onto their second year in the autumn. The Jette Parker Young Artists Programme is generously supported by Oak Foundation. The Jette Parker Young Artists perform in a free lunchtime recital every other Monday. Splendid! The Programme is so good and does wonderful work, and I'm sure the new Artists will benefit hugely; I look forward to hearing them.